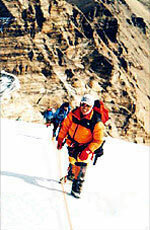 This most interesting and highly praised trek brings you to the base camp of Annapurna I. More important topic - the route provides you an information about varieties of natural and cultural diversity. Breathtaking views of Annapurna Himalayan range, picturesque Magar and Gurung (the brave Gurkhas) villages, romantic paddy fields, beautiful Rhododendron forests, dramatic landscapes are the Major attraction of this trek. This package includes short rafting trip on the way to Pokhara and Wildlife Safari tour to Napal's famous National Park for 2 nights 3 days at the end of programme. Day 01: Drive to Trishuli River takes around (3 hr) for a short rafting tip on the way to Pokhara. 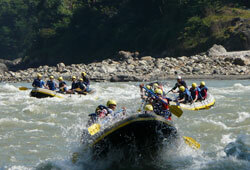 After 3 hrs rafting lunch will be served than continue drive to Pokhara overnight in the hotel. Day 11: Trek to Nayapul - 1000m. (4-5 hr) Trekking trip end at Nayapul. Drive to Pokhara and transfer to the Hotel you like to O/N. Rest of the time free in Pokhara for your personal activities. 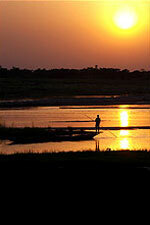 Day 12: Drive to Chitwan National Park (around 5 hr), pick up from Chitresari and transfer to your lodge. Day 13: Full day wildlife activities such as Elephant back safari, Jungle walk, Canoeing, Bird watching, Culture program in the evening etc..
Day 14: After Bird watching in the National park breakfast then drive to Kathmandu by toursit bus/car if you wish you can fly instead of 6 hours drive to Kathmandu. Trip over. Day 15: Fly back to home or go for onward program. - Hotel accommodation according to the above plan in Kathmandu and Pokhara as per your interest and budget. 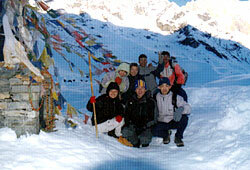 - All supporting staffs (trekking guide and porters), as well as their necessary insurance, meals and allowances. - All the necessary Rafting equipments such as life jacket, paddle, helmet, wet suit, Professional Raft guide, safety kayakers. - Land Transfer according to the program. - Accommodation and all the activities in Chitwan National Park such as Elephant safari, nature walk, Jungle drive, bird watching, village tour, National park entrance fee, cultural activities etc.